David Murdoch is looking to the "next big thing", the Scottish Curling Championships in February, to establish his rink as the best in the country. Murdoch's rink lost to Ewan MacDonald's in the 2015 final and with it the right to play in the World Championships. 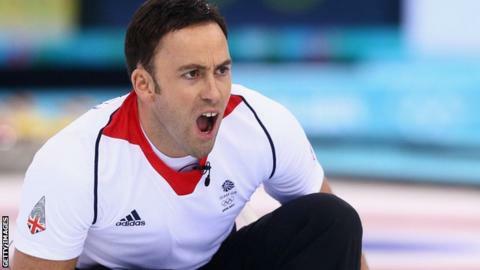 And he was pushed into third by the rinks of Kyle Smith and Tom Brewster in October's European Playdowns. "We have to train harder and get ourselves to the top of the tree," Murdoch, 37, told BBC Scotland. Murdoch admits he and his team had a "difficult year" after returning from the Sochi Olympics in 2014 with a silver medal. That third place in the European qualifiers cost Murdoch and his team of Greg Drummond, Scott Andrews and Michael Goodfellow a place in the European Curling Championships in Esbjerg, Denmark from 20-28 November. "We're a little disappointed that we're not there," said the skip, who has three European gold medals to his name, along with two World Championship successes. Looking ahead to vying for the Scottish title, he added: "We now need to show that we're the top team in the country. "It's not all lost. We need to show a bit of confidence and work hard and put in some good performances. "It's the one big marker for us now that's left. It's the one that really matters as far as all the teams in Scotland are concerned. "They all want to be Scottish number one and go to the World Championships as Team Scotland and try to get the medal there. For us, that's what it comes down to. "It's going to be one extremely tough week in February and I think we will be ready for it." Murdoch, from Lockerbie, is spending an increasing amount of time in Canada as he strives for top-level competition. "It's almost a professional sport over there, it's live on TV every other week," he said. "That's where we need to be, playing these top guys week in, week out. "We've already had six weeks in Canada this season and we're going to Japan. It's a lot of time away. That's where the sport is and that's the dedication you have to show. "You have to follow where the good tournaments are around the world." While Murdoch is hoping his form peaks at the Scottish Championships, his mother, Marion, is being recognised by sport agency Sport Scotland for a lifetime achievement award for coaching curling. "When I started, mum had taken over the junior programme and she was a big part of how I ended up being a competitive player," he said. "She gave me that helping hand, encouraging me to go further. "Dad was super cool, so laid back, and mum was just fantastic. "Everyone respected her and at times were fearful of her but that was a good thing so that they did what they were told." Marion Murdoch said she could scarcely believe how long she had been coaching. "I think it was when my children were younger that I realised I was picking up points that I could pass on and someone asked me to do that 25 years ago," she said. "We start with the grassroots - Try Curling - and we have little ones of six-to-eight year old. "I also do disabled coaching and wheelchair coaching. It is nice to have variety to offer people so that they can take part. I get such satisfaction at seeing someone progress."